This book takes you down the rabbit hole of what’s actually involved in pursuing the restaurant dream, starting with the dream itself–is this a real goal or just a lark?–and continuing with the process of finding a space, negotiating with landlords, designing an interior, executing that interior, overcoming obstacles (inspectors, an oven that doesn’t fit through the door), hiring personnel, creating a menu, testing the menu, and opening the place up to customers. It doesn’t end there, though; then there’s the cleaning, the prepping, the firing people, the re-hiring people, the dealing with customers, the dealing withs spills, and–ultimately–the dealing with the fact that you have to deal with all of this day in, day out for as long as your restaurant remains open. Molly’s gift is to walk you through the process while simultaneously broadcasting her own emotional journey as the restaurant begins to swallow her up. The book’s subtitle–“A Man, A Woman, A Restaurant, A Marriage”–is totally apt. She really goes there, walking you through intimate scenes of screaming, sobbing, making-up and sobbing again. 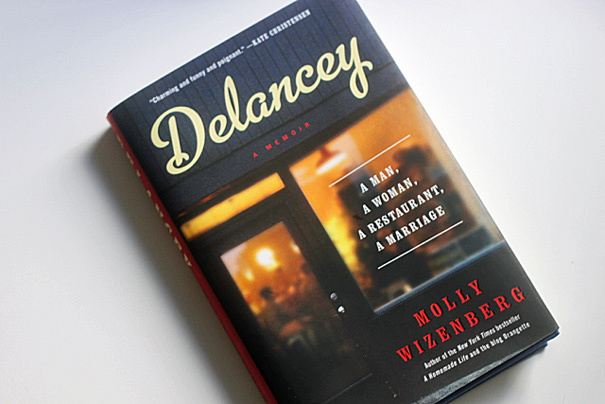 Apparently a restaurant really can undo a marriage; how Molly and Brandon worked through this provides the book’s emotional core. And even though I’ve known these two for a really, really long time (they once housed me during a blizzard), I found the book surprising in a way that caught me completely off-guard. This book is brutally honest. And essential; especially for anyone who’s thinking about opening a restaurant. I’m passing it over today, at lunch, to my friend Diana who’s also harbored secret dreams of opening her own place. This book is a rude awakening but it’s not, in the end, a total antidote. It’s a credit to Molly that she shows both sides of the restaurant-opening experience, her own (which is mostly pretty negative) and Brandon’s (which is mostly pretty positive). As for me, my Amateur Gourmet-themed restaurant will most likely only exist in my late afternoon fantasies; the kind of fantasies you can harbor while sipping a cocktail made by someone else in a restaurant that’s not your own.